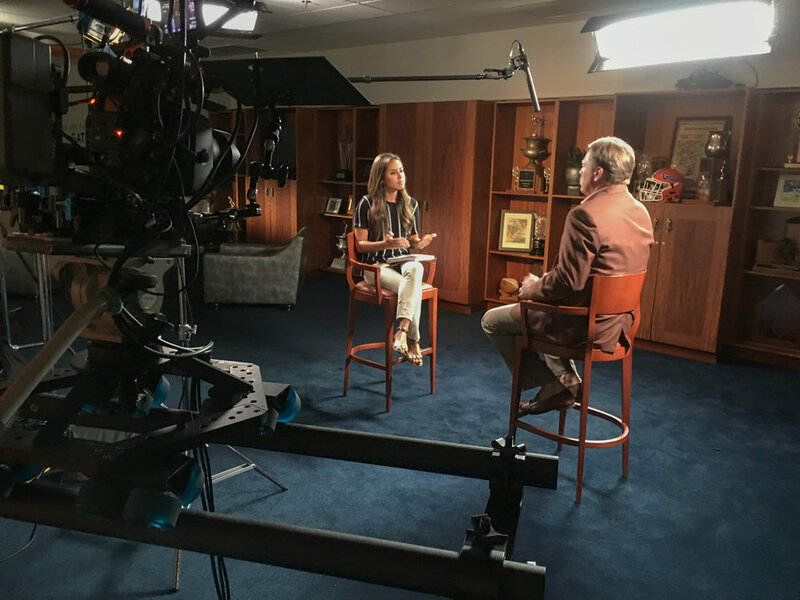 Actual behind the scene interviews set-ups for ESPN, WWE, NatGeo, CNN, NFL, NHL, MLB, SEC, and other major national and international networks. There’s a big difference between doing some talking heads for low budgeted assignments or getting hired to do interviews for high budgeted broadcasting programs such as 60 minutes, 20/20, E-60 or 30 for 30 just to mention a few. 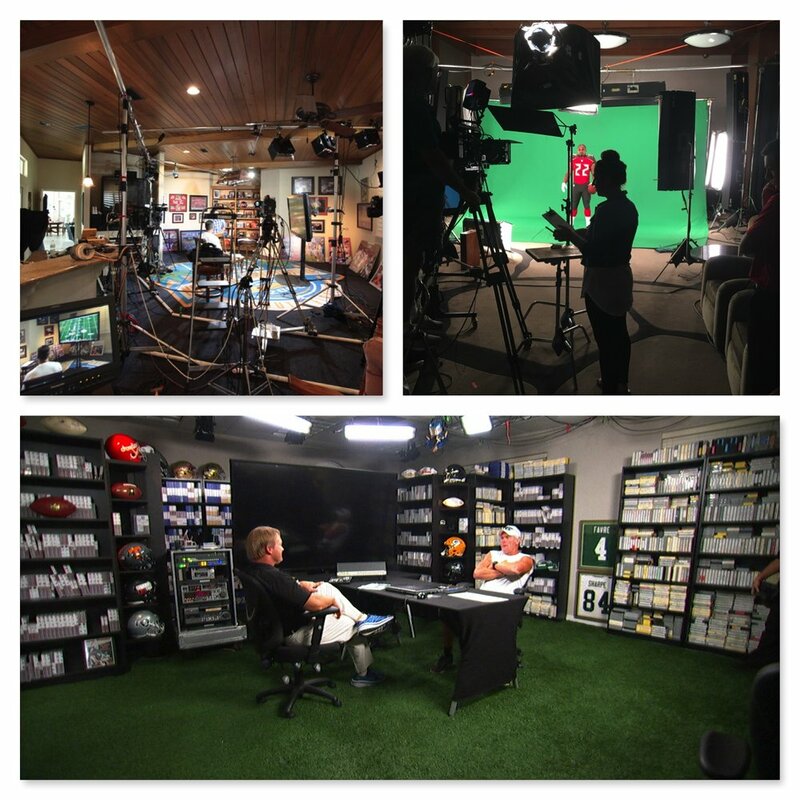 These are also the assignments that pay the highest crew rates, as example, ESPN pay a crew consisting of a cameraman/director of photography and a soundman $2400 per day, plus expenses, often to do just a single interview, that’s how important quality interviews are for national and international broadcasters and high end corporate and advertising work. Producers for these projects are demanding, they want skilled crews capable of handling every situation and make interviews look the best. Just being good is not good enough, you have to possess the specific skills that producers are looking for and need. Producers success depends on the crew they hire. This video is a condensed version of the 2 days advanced workshops that Nino has hosted for many years. Interviews are the core of most video projects, particularly features and documentaries for broadcasting. These are also the better budgeted projects that pay the best freelancer's rate. Producers for these projects are demanding, they want skilled crews capable of handling every situation and make interviews look the best. Just being good is not good enough, you have to possess the specific skills that producers are looking for and need. Producers success depends on the crew they hire. 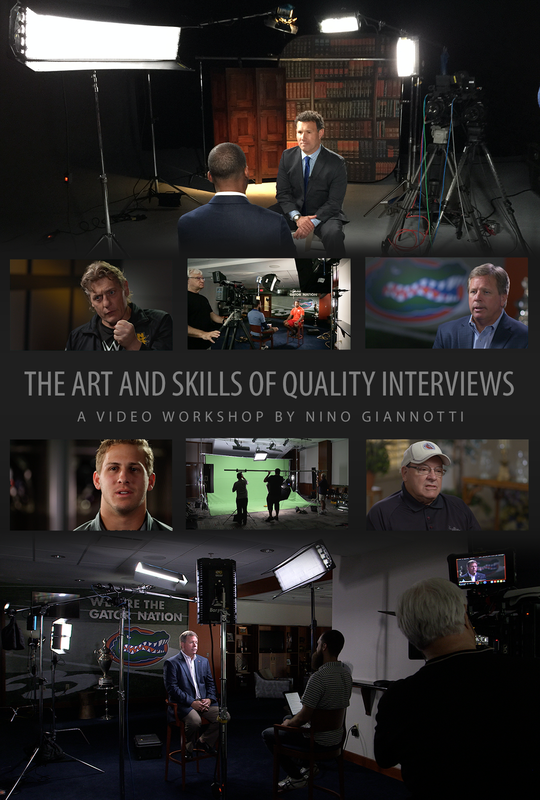 This instructional and motivational program by Emmy Awards recipient Nino Giannotti is by far the most complete and detailed program on this topic ever published in this profession. Based on the skills acquired in his long career Nino details the exact skills that producers look for when hiring a cameraman/DP. This program is a must see for those with the desire to move up in this profession and position themselves above their competition. Unquestionably this is the best small investment you'll be making to benefit your career. Most of the videos and stills in this program are from Nino's assignments and broadcasted on national television. Only a small portion was recreated for demonstration purposes, but even those were handled as real assignments. The yearly rental for this program is only $39.00 including future additions. The program starts with the variety of lights that Nino uses for his interviews, and most important why. Nino will demonstrate direct comparisons between several lights and the difference each light makes on the subject to be interviewed. You will also see many attachments that Nino designed and built himself to improve the quality of his lights. None of these are available on the market but you can easily build yourself. This video will show how to get the best out of LED technology, not just for interviews but for all assignments. This section of the program is perhaps the most important for creating quality lighting. It explains the fundamental of the Chiaroscuro (Light-Dark) lighting principle. A lighting technique that has been the foundation of quality lighting for over 5 centuries and the most widely used techniques in quality portraitures and motion pictures. Unfortunately not many in the video profession have knowledge of these techniques, it takes just as long to do it right than it takes to do it wrong. Nino will demonstrate how this principle is easily applied to our everyday work and the great difference it makes. We're seeing this way too often on television, and unfortunately even on the better budgeted interviews, unflattering light placement. People learning light positioning from Xs on diagrams instead of learning to see what the light does on the subject and the shadows it casts. This video covers in details the correct positions of each light and why. For too many in this profession creating multiple cameras two subject interviews has been a challenge. In this program Nino will show the best and simplest way to do it. You'll see how to create one, two and three camera angles, how to light it correctly and how to create three backgrounds, one for each camera. Grips and riggings to create larger sets. There are thousands of cameramen/videographers all looking for any available work, so how do you set yourself above the rest. Today being a good cameraman is not enough, they're all good, have you ever heard a cameraman say that he's not very good? You have to build a reputation that you're more than just another cameraman. You have to acquire other skills that producers and clients desperately look for, and that's someone who can create things that aren't there or quickly resolve any problem that might delay the assignments. There's a gap between assignments that only require an average crew and those more involved that require hiring a grip truck. Smart cameramen who can fill that gap are what producers look for and are constantly busy. This requires a minimum investment but a lot of knowhow, and this video will get you started in the right direction. Most of the videos and stills in this program are from Nino's assignments, so you can see exactly what's being done on top broadcasting programs. Nino will also detail unexpected situations he encountered on actual assignments and how he quickly resolved them. This kind of content and material has never been seen on similar programs, this is the next best thing to actually being on assignment with Nino. Topping the list of Nino’s worldwide clients are National Geographic, Discovery, BBC, German Television, RAI Italy, Irish Television, ESPN, ESPN Deportes, Fox Sports, NFL Network, MLB Network and many many more. Nino is an Emmy Award recipient who began his training in art, photography, cinematography and photojournalism in the early sixties in his native Northern Italy. After relocating to the United States Nino was able to continue his studies while serving in the US Army during the Vietnam Conflict. Upon his discharge from the Army in 1970 he started his freelance career that is still going strong after nearly half a century. Interviews represent only a portion of Nino's assignments. Although this program is mostly about interviews, the techniques that are demonstrated here are the same that Nino uses on most of his assignments.